The local carousel design has been in effect since June of this year, so it’s about that time when experts try to measure its success and offer more detailed advice about how to take advantage. It’s incredibly important for a company to be featured in local search in order to connect with relevant users. It helps make the web smaller, and you have less competition to worry about in the local sphere. Optimizing for local search, however, has been complicated in the past, so it’s easy to ask yourself: Has the local carousel made anything easier, and what factors will help my small business take advantage of the new design? 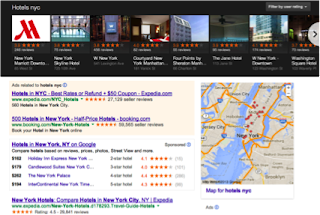 They examined more than 4,500 search results in the category of hotels in 47 US cities and made sure that each SERP featured a carousel result. For each of the top 10 hotels found on each search, they collected the name, rating, quantity of reviews, travel time from the hotel to the searched city, and the rank displayed in the carousel. They used (equally) hotel search terms—hotels in [city]; best hotels in [city]; downtown [city] hotels; cheap hotels in [city]. This earned them nearly 42,000 data points on approximately 19,000 unique hotels. They looked at the correlation between a hotel’s rank in a search result based on all of the factors discussed in step 1 to determine which were the most influential. The actual study comes complete with different screenshots showing graphically what they found for each of the factors. By and large, however, there were four findings that really stood out as something actionable for marketers. First, carousel rank correlates highly with Google review ratings. This was the information that was most obvious in the study and went for both quality and quantity of reviews. Therefore, marketers should try to optimize and put a focus on more of these reviews. Second, location does matter. 50 percent of the 1,900 hotels in the study were within 2 miles of the search destination while 75 percent were within 13 minutes. Businesses should then try to urge customers to start searching for specific landmarks as opposed to just the entire city. After all, you never quite know where Google is going to put the “center” of a city. Third, Google seems to change the weight of different hotels factors based upon the actual search. For example, if someone types in “downtown [city] hotels” Google will see that location is important, whereas if someone types in “best hotels in [city]” then quality must be the most important. As a business, focus on optimizing for every possible nuance. Fourth, the findings remained the same for both primary and secondary markets. In other words, no hotel is too small to consider online reviews and make it into the carousel.